For the longest time, one of my most unpopular opinions was my dislike of The Godfather. I found the pacing slow and the tone uninteresting. It was difficult to be sympathetic to a bunch of wealthy, white, gangsters. I found the whole thing overly masculine, and with the melodrama as overstuffed as their favorite cannolis. Of course, I kept this to myself and nodded whenever somebody referenced an offer they couldn’t refuse. One day, I stumbled upon an episode of The Sopranos, another show I dismissed, but decided to give it a try, and, like in a trance, I was enveloped into this whole world of psychoanalysis, family trauma, and decaying New Jersey trees. Watching The Godfather post-Sopranos, it is as if I have learned a new language, completely fluent in the rhythm of Italian slang (Gabagool never looked so delicious), the intense pain of an intoxicating American dream, and a group of people so entrenched in tradition, they invest very little in the future. I’m assuming if you’re reading this article, and you’re a diehard Pachino fan, you may have some interest in David Chase’s motley crew, and for good reason. If The Sopranos is Return of the Jedi, The Godfather Trilogy is New Hope and The Empire Strikes Back. The blood spills from one movie to the next, the cancerous nature of murder that consumes every member of the mafia. I will try my best to isolate this film from both The Sopranos and the two sequels that follow it, as it stands alone in occupying the second spot in this cannon. Yet, I think it’s important to note that in the many themes these films have in common, one of the strongest is the duality of narrative; one of the triumphs of the Italian community, and the other of the dire consequences of an unregulated powerful elite. 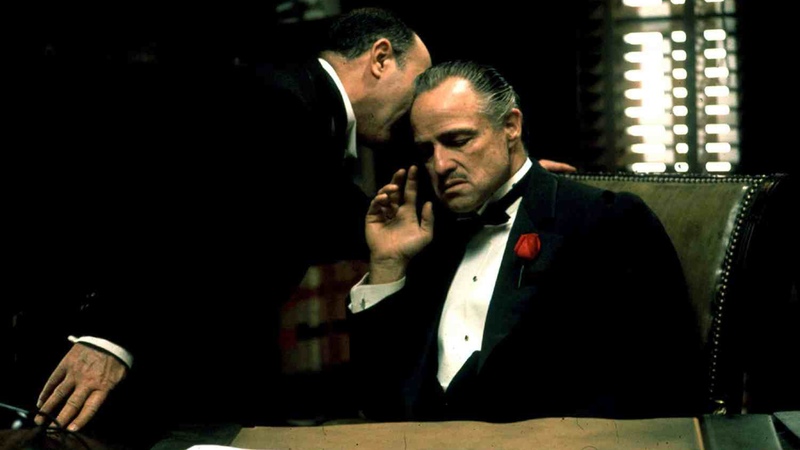 With a hearty spoilers warning, I present the number two spot on the AFI list, The Godfather. You don’t know generosity until you encounter a Sicilian mafia boss on his daughter’s wedding. At least that is what everyone in Italian New York seems to know, as we open with Don Vito Corleone (Marlon Brando, in one of the most impersonated performances in history) taking such requests on the day of his daughter Connie’s, wedding. In between business negotiations and ring kissings, he is excited to see that his whole family is together, especially his youngest son Michael Corleone (Al Pacino), a non-mafia associated “civilian” and World War II vet with his waspy girlfriend Kay Adams (Diane Keaton, why’d you take this role?) on his arm. Michael adamantly rejects the business of his father and brothers, Sonny and Fredo. But the business is changing for the Corleones, as the pressure to enter a new venture of pushing drugs, makes it harder for Vito to opt out of participating. The Corleones’ power and disapproval of the traffic leads to a war with rival mafia family, the Brazis, leading Vito to be shot in the street (he survives). Sonny goes on a revenge rampage, and Michael gets more involved in his family’s affairs, ultimately deciding to shoot two of Brazi’s most important men. He flees to Sicily for protection, leaving Sonny to (mis)lead the rest of the crew. Sonny’s temper only heightens when he learns that his sister’s husband, Carlo, is abusing her. After one frantic call from his distressed sister, he jumps into a car without protection to go to her aide, only to be gunned down. Sonny’s murder brings a change of heart for Vito, as he calls a meeting of the five families to a truce, announcing that the mafia will go into the drug business so long as all war will be forgiven, swearing that no revenge shall be carried out on Sonny’s behalf. A changed Michael comes back to take over as Don of the family, with Vito as an advisor. He takes Kay as a wife and starts to acquire casinos in Las Vegas. Vito warns Michael of a betrayal of the peace by the other families, and when he dies from a heart attack, Michael is approached by Brazi for a meeting. Michael sets up a counter-attack, and while he becomes the godfather for Connie’s child at the baptism, his men successfully murder all the other New York dons. After the baptism, Michael confronts his brother-in-law, Carlo, explaining that he knows he was behind Sonny’s murder. Michael proceeds to murder Carlo, but when Connie hears about her husband’s “sudden death” she barges into Michael’s study accusing him of killing her husband. Michael shoos her away and reassures a nervous Kay (now his wife, for some reason) that he did no such thing. Famously, Kay is quickly kicked out of the room once Michael’s associates arrive, closing the door on her and the world to which she is not privy. Unlike the gangster films that came before it, The Godfather was one of the first widespread, and unapologetically Sicilian pictures, ever created. In many ways it is seen as a celebration, paving the way to view this as a triumph of the immigrant society and formation as a people in a new homeland. In this uplifting way of looking at the film, there is no mistaking the film for its religious elements, the title itself foreshadows to the pinnacle baptism scene. Beyond the Roman Catholic motifs, this story seems to draw on the Hebrew Bible’s themes of biblical redemption and exodus. Michael’s name and journey connote that of Moses, a lost son who starts the film integrated into his own Egypt, American culture. His father is both a godfather and a god-like father, who ultimately guides Michael back to his people. After Vito gets shot, along with a couple of run-ins with corrupt xenophobic cops, Michael makes the decision to murder his family’s enemy. This forces him into exile in a foreign land, not unlike a similar protagonist’s trajectory in Exodus 2:11-15. When Michael is summoned back from Italy, his family is in a worse place than when he had left. They are down Sonny and many other men, and he comes as a savior from a foreign land to redeem his family and bring them to a new promised land of prominence and security. Which Michael does, through listening to the advice of his father and carrying out his plan, as if it were God telling him how to smite his enemies in order to free his people. Indeed, this is a sentiment expressed throughout the film and one that Sonny whole-heartedly disagrees with, following his temper to exact extreme revenge for the attack on his father. In fact, it is his temper and needs to exact violence without thinking of repercussions, that causes his rash decision to chase after Carlo unprotected. Michael’s approach is perhaps a mix of all three of these men’s approaches. His killing of Sollozzo is an act of vengeance for his father, causing him to escape back into exile. However, all his actions after that were less emotionally driven and more tactful. When he killed all the other Dons, it was overall an act of self-defense, but specifically killing Moe Green was a way of obtaining his casinos. He does what he has to do to survive and succeed, much like Sollizzo. When he kills Carlo however, he is not just exacting revenge, but setting a wrong right. He makes Carlo admit to the conspiracy, and then kills him in a car, much like how Sonny was killed. Sure, Sonny was Michael’s brother, but this is about righting a wrong that goes further than a vendetta, about trying to tap into the honor code of his father. I suppose this is how somebody like Tony Soprano would like to look at this film, (and in fact, we know he did in S6: E8)… that the underdog, Sicilian, immigrant community was set up to fail by the ills of the oppressive American government. However, as the film unwinds further, this view becomes harder to buy, especially for Vito, whose morality gets challenged and forced to be compromised. One sees that for Vito, this film isn’t about redemption or that splitting of the seas, it is about the fall of an empire, the death of an idealized mafia. Focusing on the Marlon Brando character, without the knowledge of his younger DeNiro self, the Don starts as a powerful and successful head of a family. He has his hands in the pockets of the politicians and small businessmen alike, assuring protection to those who seek it. His only daughter is getting married to a seemingly good guy, and he’s living in a beautiful estate; he’s made it. Suddenly a man approaches him about selling narcotics. Vito himself feels a certain way about the use of narcotics: it is an uncontrollable evil. Therefore, relying on his judgment and ethical code, he refuses to go into business with it. Less than twenty minutes later in the film, he is gunned down in the street like a common man. Drugs are so much bigger than his power and nobility, it is too lucrative a product. Mafia, with all their values and tradition, will choose money and power first and foremost, everything else will fall by the wayside. Vito is experiencing this for the first time and risks the lives of his family and friends in order to combat this new wave. He may have not wanted a full rejection of Sicilian culture, but he wanted something bigger than what Michael gets. He wanted Michael to bring them closer to being a legitimate company, not farther away from it. Michael however, doesn’t seem to understand this, and Vito sees that he has lost another one to the mafia madness. The world is changing, the business is getting dirtier, losing whatever soul it once had, and it’s going down a path to doom. It only seems proper that Vito’s last moments were playing with his grandson Anthony, chasing after him, and then collapsing to the ground. He tries to make a connection to the next generation, to reach and teach them, but he literally dies in his pursuit. The old man with old values and old ideas gasps his last breath in the dirt of the orchard. When Michael returns to the States and attempts to woo Kay back, she resists, faulting his family business. He says that all powerful men have murky morals, and Kay says “Senators and presidents don’t have men killed.” Michael responds “now who’s being naive?” Before more recent political times, this could have been interpreted as a smart retort, turning the judgments back on a critical waspish audience who take an unwarranted moral high ground. Today it seems to capture the essence of the Corleones, a statement made from extreme privilege, a group of people who see themselves as the oppressed, and use the inhumanity of others to justify their own. It’s exhausting Twitter talk, and one of the most dated lines. With my heightened new appreciation for the film, I still seem to secretly think that it’s about crying white men who, in the name of equality and freedom, are doing more harm than good.